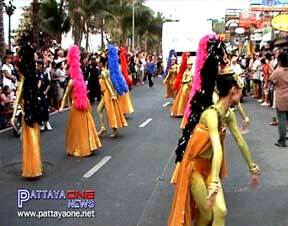 Plenty of fun at the Pattaya Mardi Gras Festival. 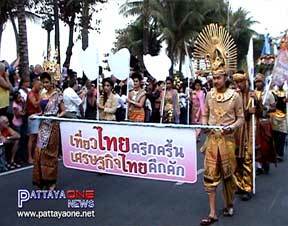 On Friday, Pattaya’s roads came to a standstill as the Pattaya International Mardi Gras Parade took place which coincided with the opening of the Central Festival Pattaya Beach Shopping Center located at the corner of Soi 9 on Pattaya Beach Road. Hundreds turned out to enjoy the Mardi Gras Parade which, although it could not be compared to Mardi Gras Parades from around the world, it was plenty of fun for those who took part and for those who came to watch. It was colorful, fun and full of energy and included some spectacular costumes and dancers along with some well-decorated carnival floats. Many local tourist attractions such as the Alangkarn Theatre and Mini Siam took part along with Beer Bars and a number of Thai Superstars such as Cindy and Paula Taylor. Looks gay to me, mind you, I wouldn't like to fall out with the bloke with tha massive, sharp-looking headress! Could hurt at both ends! This kinda thing should go over big here. Thai Superstars such as Cindy and Paula Taylor.